Despite the fact that it was 90 degrees here in Los Angeles yesterday and I was swimming in the ocean, cold and flu season is still upon us. And with two young children in the house, I am sure we will be having our fair share of runny noses this coming winter. So I am already looking for ways to boost my immune system, ready for the imminent onslaught of kindergarten germs. With local weather forecasters predicting a bitterly cold week ahead (yes, 65 degrees is considered bitterly cold here) I decided to create a smoothie full of immune-boosting goodness. I searched through my cupboards looking for potential ingredients that would fight inflammation, provide antioxidants, and help keep colds at bay. The result was this delicious immune-boosting smoothie. 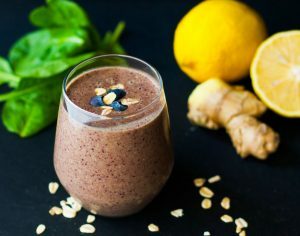 Ginger, turmeric, flax seed, lemon juice, spinach, and blueberries are all rich in antioxidants. Antioxidants help get rid of the reactive oxygen species that contribute to inflammation in the body. Too many reactive species leads to an imbalance in the body’s defense system, known as oxidative stress. This leads to inflammation. Antioxidants help prevent it from happening. Flax seeds also contain omega-3 fatty acids, which have anti-inflammatory effects in the body. Oats contain beta-glucan, a soluble fiber which has been shown to activate white blood cells, the cells of the immune system that help protect the body from foreign invaders. Spinach contains zinc, which is important for cell survival and immune function. Kefir is a fermented milk drink (a bit like yogurt) which contains probiotics. Probiotics help keep your gut healthy. And because 70% of your immune system is located in your gut, they also help support your body’s natural defenses. Banana is a great source of prebiotics. Prebiotics are food for the probiotic cultures that help your immune system run smoothly. Flax seeds contain soluble fiber, which has been shown to improve immune function. So if you feel as though your immune system needs a little help, why not give this immune-boosting smoothie a whirl. 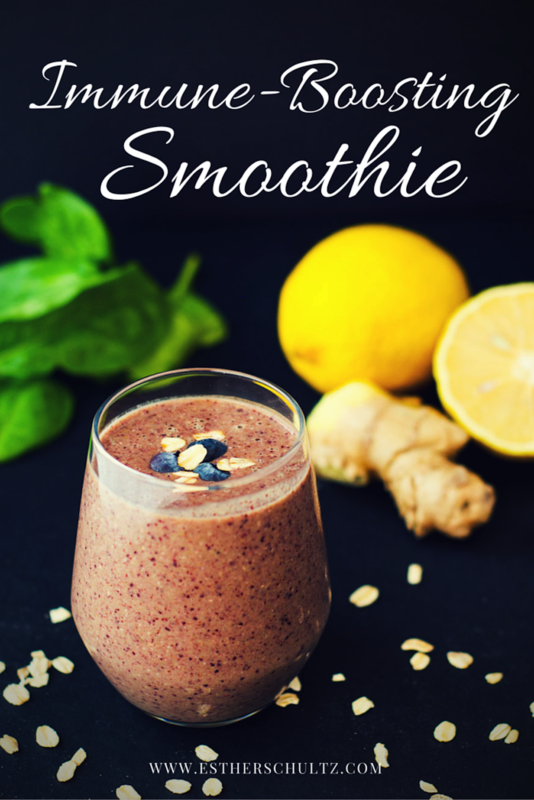 A healthy blueberry oat spinach smoothie designed to give your immune system a boost. Drink straight away to minimize the loss of nutrients. perfect for this time of year- all of my kiddos (and by kids I mean students) have been sick! You must have an immune system of steel as a teacher! I love that you include a breakdown of all the benefits of this smoothie! The recipe sounds wonderful. Will have to try this!